If by some chance you’ve been on another planet, or are new to cooking, you may not have heard of Sullivan St Bakery no knead bread, made famous by Mark Bittman, the New York Times food writer. Just four ingredients, minimal work and a great result. I’ll repeat the recipe here in case you missed it. I’ve tweaked it a bit over the years and I’ve gotten fairly slapdash about the way I make it. It really doesn’t make a lot of difference. It’s another very forgiving recipe. 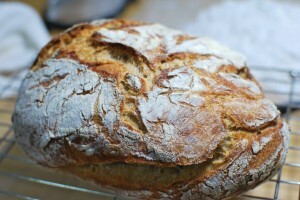 The outcome is certainly better than any kneaded bread recipe I ever made. I had a history of producing bricks. This method produces a crusty artisanal looking loaf or rolls that you can be proud of, with virtually no work. It tastes delicious too. The only downside is that it takes time. If you put the bread on tonight, you might eat it for lunch the next day in summer or breakfast the day after in winter. But the wait is worth it and there is almost no effort. I’ve been eating mine recently with tofutti cream cheese and raspberry jam. Mix the flour, yeast and salt together in a large bowl. Add water and mix until just together. This only needs about 30 seconds. The dough should be sticky and there might be bits of flour here and there. Do not worry. Cover and leave to rise for at least 12 hours, the longer you leave it the more sour it is. I've left mine up to 24 hours in winter with no ill effects. It doesn't need to be in a warm spot. The whole point is for this bread to rise slowly. It will rise fairly dramatically with bubbles on the surface as the dough is so wet. Turn/scrape out onto a floured bench and bring together into a ball. If you're making a loaf flatten slightly into a rectangle and fold ⅓ towards the centre and then fold the other. What you will have is a vague loaf shape that has a seam on the top. If you are making rolls, roll it into a sausage shape and cut into 6cm lengths. Leave to prove for 30 minutes while the oven is heating. It will not double in size. The miracle will happen in the oven. If you want you can extend the proof to 2 hours - the original recipe does this but honestly I haven't noticed a significant difference in the quality by skipping the longer proof. Preheat oven to 225 degrees C with a cast iron casserole in it. Leave it there to heat thoroughly for 30 minutes. I use a deep oval one when I am making a loaf and a flat dutch oven when making rolls. Take the casserole from the oven - it will be HOT. Scatter some dry polenta into the bottom. This will help things not to stick. If making rolls drop the pieces into the casserole, they can touch. If you are making a loaf, drop the loaf seam side up into the casserole. Put on the lid and put it back into the oven and let it cook for 30 minutes. Reduce the temperature to 200 degrees C, remove the lid and cook for a further 20-30 minutes until golden brown. Turn onto a cooling rack and let cool for at least 30 mins before slicing. If you cut it before this it ruins the texture. Be patient. You can make this bread as a loaf or rolls. Both are equally successful. I've given instructions for both. Just confirming you just leave this out on the bench, no refrigeration required?